Following the tragic events at Grenfell Tower in London last year, in which fire ripped through the building and so many people sadly lost their lives, the cladding of tower blocks, and the materials used, has come under the spot light, As the safety of many high-rise buildings, up and down the country including here in Plymouth, is called into question, it has become necessary to replace it on certain buildings. Some cladding, can be highly flammable and it is critical therefore to replace any that is a safety risk to the residents. But why is cladding used? It was necessary to carry out an audit of all high-rise buildings with Plymouth cladding to assess the risk to life. In many instances, the cladding has to be removed and replaced with fire-retardant material and not the aluminium composite material that was responsible for the rapid spread of the fire at Grenfell. 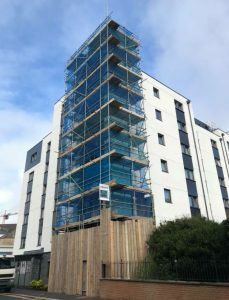 One such building that required replacement cladding was this student accommodation in Plymouth. The old cladding was removed and a new, safety approved version was installed. In order to be able to work safely on the building, the contractors needed scaffolding. We were delighted to be chosen to work on this product as, with safety at the heart of everything we do, we to are keen to see these tower blocks re-clad. 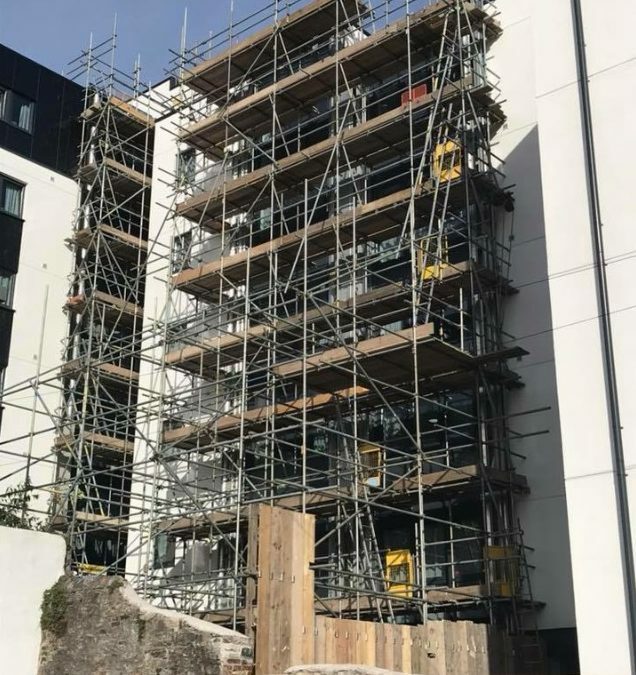 If you need scaffolding contractors for your projects across the South West areas of Exeter, Plymouth, Truro, Taunton and surrounds, give us a call and we will be delighted to assist.